Its now more than eight months since Google surprised everyone with the instant hit called Google Now – Google’s reply to the world famous Siri. So you might be wondering why am I bringing this up now. The purpose here is not Siri bashing nor a review of Now. Being from a Business Intelligence community, Google Now has amazed me in one critical aspect – delivering the right information at the right time. I totally agree that Now has is in its early stages and has a long way to go. Lets get into the details on why Google Now should inspire future Business Intelligence systems. Isn’t providing right information at the right time the ultimate goal of Business Intelligence ? How many business intelligence systems really meet this objective ? Before going any further lets make it clear that Comparing Google Now against a business intelligence dashboard is not 100% fair. 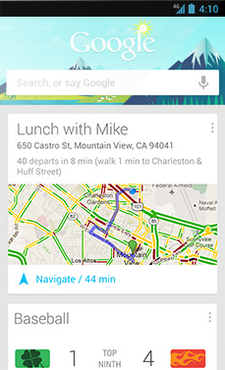 Google Now is a consumer facing ecosystem and most importantly on a mobile device which has location intelligence. Its a personalized experience. Whereas a BI dashboard is something which should make sense for a group of people and is a corporate ecosystem. Real time location intelligence for a BI dashboard does not add much value unless we are talking about decision makers who travels a lot. So lets see why a system similar to Google Now should be the ultimate goal of enterprise BI. The key here is real time in my opinion. Lets take an example. Since I love travel and photography, before I leave to any place I Google and find a list of photo spots. Google Now does that for me automatically and more importantly when I am near that spot. Lets project this use case for a business. I am running a promotion for my product and without a real time BI dashboard, I cannot ascertain how my promotion is effective or whether my competitors are doing a better job than me.In traditional BI implementations I have to wait for hours or worst case until next day to see the metrics. Precious time has lost which means I lose business. Lets consider another area of concern with current BI. Most implementation provide reports like sales numbers, customer retention metrics. It relies on humans to interpret them based on their prior experience or intuitions. Lets contrast this with Google Now. It uses machine learning ( its a current buzzword, but In my opinion it is almost similar to data mining) to know my interests and suggest me for example when my favorite sports team is playing their game near to me. Lets see how machine learning can be of help in running a promotion. If your algorithm knows that a particular day of last year has yielded better return of investment on promotions it can suggest you to run the same the current year. You don’t have to break your head crunching last years results. Google Now crunches Big Data ( Mail, Search history, Youtube History and many more) to get us the relevant information. Like wise future BI systems should be able to make use of large volumes of unstructured data and derive business value. I am certainly very impressed with the various startups which is trying to solve the enterprise BI using BI As a Service model. Some of the implementation heavily focus on real time user data which is a move in the right direction. One of the key concerns with this implementation is a security of data in the cloud which is a topic by itself. Hopefully enterprise BI will catch up with the fast paced consumer software market. Eventually it has to ! !